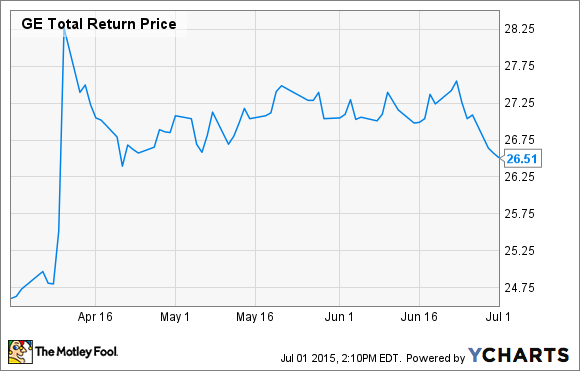 Is the New and Improved General Electric a Buy? This is not your father's General Electric (NYSE:GE) anymore. It might not be your grandfather's General Electric. Most recently, a $2.2 billion deal to sell GE's European Sponsor Finance division to Sumitomo Mitsui Banking. Combined with past sales and dispositions, GE Capital bits and pieces have raised about $63 billion for the company so far, en route to GE Capital CEO Keith Sherin's stated goal of raising $100 billion through unit sales "by the end of 2016." The question facing investors today is, what will be left when all this is over? The happy answer to that is that, once all the financial businesses are out of the picture, a new-and-improved GE should be a much easier business to analyze -- so you can decide whether you want to invest in it. According to a Wall Street Journal analysis of the restructuring plan, General Electric should by 2018 be at least "90%" an "industrials" company. Granted, 10% of the company's earnings will still come from such businesses as lending to energy companies that buy its equipment, and leasing out aircraft to airlines (which tends to support GE's airplane engine sales). But no longer will GE depend on its banking arm for half its profits. Rather, the key businesses going forward will be in such easy-to-analyze fields as power equipment, oil and gas, and aircraft engine production. As GE CEO Jeff Immelt explained in April, this back-to-basics approach should help the company deliver "solid double-digits" growth in operating profit even as early as 2015, with industrial businesses forecast to earn between $1.10 and $1.20 per share this year. Indeed, "solid" looks to be an understatement, as according to GE's financial report for 2014, the company earned only $0.96 per share last year. A move to $1.10 in industrial operating profit would therefore equal 14.5% earnings growth -- and a move to $1.20 would represent 25% growth. It's not often you see $267 billion market cap companies growing at speeds like that. The potential for 25% earnings growth, plus GE's promises of more dividends and share buybacks, probably helps to explain why shares spiked as high as $28.51 in April when the company announced its near-entire exit from the banking business. But what explains the stock's subsequent slump (to a recent price of $26.50 per share)? Well, consider: $1.20 per share in operating profits, plus, say, $0.12 more from a GE that hopes to get 10% of its business from banking in the future, might net GE about $1.32 per share in 2015. That works out to a P/E ratio of 20 on GE stock at today's pricing. This seems like a good bargain if the company continues growing at 25%. But it's very hard for large businesses to consistently post that kind of growth. Problem is, GE stock might not be much of a bargain if it grows only 14.5%, or grows at the 10% rate at which industrial profits grew last year. Adding to GE's difficulties, industrial cash from operations ($12.2 billion) last year came in significantly behind reported operating profit ($17.8 billion). So when valued on free cash flow, GE stock is likely going to look even more expensive than when valued on earnings. Simply put, as General Electric offloads its banking unit, it is becoming easier to analyze the company and decide how much GE is worth. The problem for investors is that it's also getting easier for us to see that GE is overvalued today.